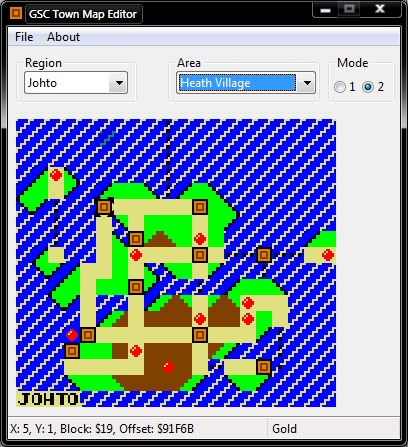 This program allows you to easily edit the map that appears on the Pokégear and Town Maps in games Gold, Silver, and Crystal. 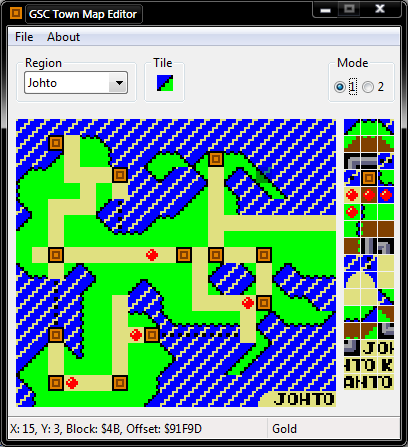 It allows editing of both Johto and Kanto maps. This program is able to be compiled on any OS that can run Lazarus. Included is the Windows executable, for any other OS you will have to compile it yourself. The source is included in the zip. It's fairly simple to use. On the right of the screen is your tileset box, which shows you the tiles you can use. Click the tile you want, and you're ready to start editing in the left box. You can also use your mousewheel to scroll through the tiles, or right click a tile on the map to select it for drawing. Unfortunately, I don't yet know enough to make this load the tileset from ROM. Instead, it's loading it from tileset.bmp. Maybe eventually I'll make it load from ROM, but until then, the current setup works fine. Looks nice. I'm assuming it doesn't yet have the ability to edit where the locations show up on the map though? Does it load the tileset from the rom itself? 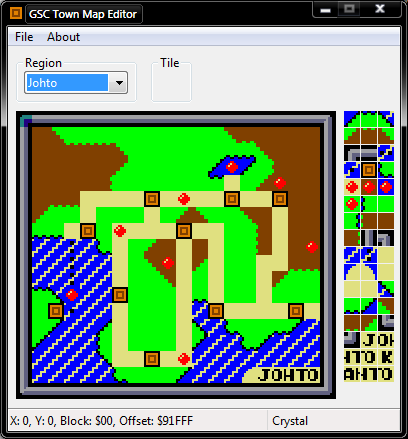 Might be worthwhile considering many people edit the tileset for custom region names etc. No, I honestly hadn't thought of that. That's actually a really good idea though, and I don't think it'd be too hard to implement. I seem to remember the place where I saw what bytes were used to determine where it appeared, but I can't. I seem to remember it being a part of the mapheaders, but it isn't from what I can tell. No, I don't know enough to do that yet. I do have the tileset location ($F8C94 G/S, $F8BA2 C). Right now though they could just extract the tileset and replace tileset.bmp with it. I think IImarcus just wrote a comment of editing the map headers and in a part of it, you could edit where the areas are shown in the map. The map headers just show which map name they belong to, such as New Bark Town, etc. As for the locations on the map, they are stored separately. x92386 = Cursor/map name data! Format: Xloc, yloc, Name pointer [2 bytes] That will be for Gold, probably Silver too. Crystal is likely to be different but you can find it pretty easily once you know what you're looking for. Ah, changing the locations on the map should come in really handy. It always took a while to do and was really annoying, especially when you got it off by a tiny bit. If you could figure out how to make it read the tileset from the ROM, it would be helpful. Not necessarily required though. Also, I think the ability to save and load the map as an external file could be useful, especially if you end up re-doing one of your hacks and want to copy it over without manually re-drawing it, or if you have multiple hacks with the same region. Alright, what do you all think of this? Ignore my debug box, it's showing wrong coordinates. Mode 1 is normal drawing mode, and Mode 2 is map position mode. In Mode 2, all you'll have to do is click and the map position gets moved. Since you all know, where exactly do the X and Y coordinates point for the map position? Is it the center, or the top left corner? I had to use an awkward equation to get it to draw the marker in the right position. The export and import map is a good idea. Shouldn't be too hard either. Needed one of these for a long time, thanks! The location features should come in VERY handy. Doing that is time consuming. Does it read the location list from the ROM? It does, so it will work correctly even with modified ROMs. One thing is, once you get into the Kanto side you'll have to change the map manually. I could make the program change it, but then there'd be problems with modified roms if they make more locations on one map. So it'll be a "bug" that stays. Working on exporting now. All it's going to be is a 360 byte file of the map data. I really didn't expect this to be so popular suddenly. I just found the offsets when I was going through old messages on here and found them in a list from Melash, and decided to make it. I'm glad it reads it from the ROM, that should be helpful. As for it being popular, it's always been something I've wanted for quite some time, editing by hex was time consuming and really annoying, this program makes it much easier. Should have it finished by tonight. Currently trying to figure out a problem where saving the changed location is wrong, while it's claiming to write the correct data. Well that was insanely simple. I'm not sure exactly if it points to the top or middle, but it looks like you've got it taken care of whether it is exctly the way the game does it or not, as long as it looks right in here and saves it right haha. Sorry to those who downloaded already, but this update has everyone's suggestions (minus loading tilesets from ROM). I didn't find any bugs, but if you find one be sure to let me know and I'll fix it ASAP. If you didn't notice, the "Area" list is generated from the ROM, which makes it compatible* with hacks. *: Unless of course you change the internal name of the game, in which case the program will call it an incompatible Rom. Prism is an example of this. Practically, it's half well-made but some areas seem to be in weird places anyway. Yeah, that was described a few posts back as a "necessary bug". 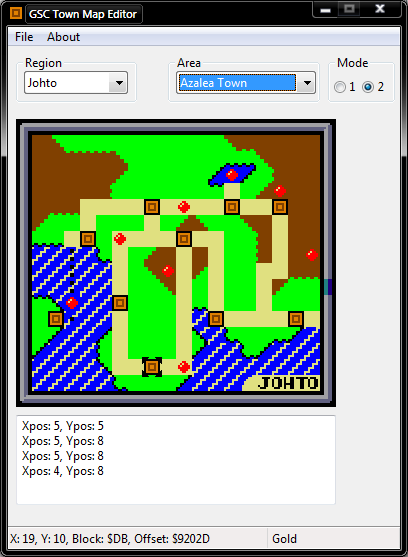 There's not a way to differentiate between whether or not the box is meant to appear on the Kanto or Johto map, so you'll have to change "Region" manually once you go past whatever the last map is for Johto (I think Mt. Silver). I could have made it change region automatically based on the index of the Area box, but then there would have been problems had someone found out how to increase or decrease the number of map positions on each map. So, there is a way to change which region the areas belong to, right ? 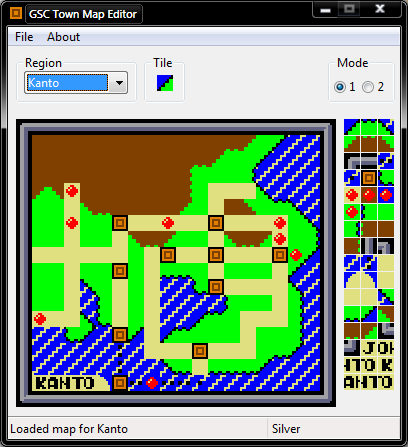 There are several places which I'd like to put to the Kanto map. I guess I'll try to remake the region map or leave it as bad-looking as it's now. Works like a charm, the new update is pretty useful, thanks! I'm not entirely sure how that works either. I assume there is a pointer somewhere saying where Kanto starts, plus there are 2 seperate loop points for kanto. One is the pre-elite four loop, you know if you surf over and "take your first step into kanto" that just loops from the johto route up to the elite four, and the post elite four loop that does all of them. I couldnt find these to edit them right, so in SaR I replaced Johto's Areas and map with Kanto's names and map, which also gave me a few extra locations to use, such as safari zone and whatnot.